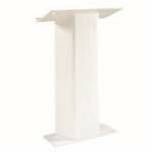 White Acrylic Podium Rental. Great for presentations. Can add graphics / logo for an additional fee.